Have you ever wondered which herbs go best with a particular food? Here's a guide that will help you season with confidence. Choosing herbs and spices for cooking can be more than a little intimidating if you are a beginner cook or even an experienced one. The last thing you want to do is ruin that expensive cut of meat or the special casserole you've worked so hard to create. Herbs can be used singly as well as in seemingly endless combinations. For beginners or even seasoned cooks (pun intended), an easy method for taste-testing herbs, spices or combinations of seasonings is to mix a little into a small portion of cream cheese or other mild cheese. Let that sit at room temperature for approximately an hour and sample. Bouquet garni - parsley, basil, bay, oregano, rosemary, and tarragon. Beef -- basil, bay, chili pepper, cilantro, garlic, cumin, mustard, oregano, parsley, rosemary, pepper, sage, tarragon, thyme. Chicken -- basil, curry, dill, garlic, ginger, lemongrass, paprika, saffron, sage, tarragon, savory. Lamb -- basil, cinnamon, cumin, curry, dill, garlic, parsley, rosemary, thyme. Fish -- basil, bay, chives, curry, fennel, garlic, ginger, mustard, parsley, tarragon. Beans -- cayenne, chili flakes, onion, parsley, ground pepper, sage, thyme. 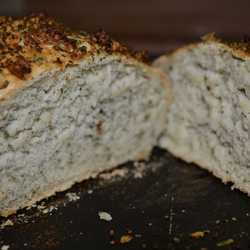 Breads -- anise, caraway, cardamom, cinnamon, cumin, dill, garlic, onion, oregano, poppy seeds, rosemary, saffron, sage, sesame seeds, thyme. Fruit -- allspice, anise, cinnamon, cloves, ginger, mint, nutmeg. Tomato-based dishes -- basil, chili peppers, fennel, ginger, lemongrass, marjoram, oregano, parsley, thyme. 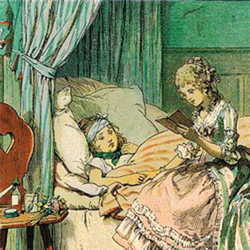 Sweets and cakes -- allspice, anise, cardamom, cinnamon, cloves, fennel, lemon peel, orange peel, ginger, nutmeg, mint, rosemary. Cheese dishes -- basil, celery seed, chili peppers, chives, coriander, cumin, curry, dill, garlic, horseradish, mint, mustard, paprika, nutmeg, parsley, sage, tarragon, thyme. Eggs -- basil, chili peppers, chives, curry, dill, fennel, ginger, marjoram, oregano, paprika, parsley, pepper, sage, tarragon, thyme. Potatoes -- chives, dill, oregano, paprika, parsley, rosemary, tarragon, thyme. Salads and Salad Dressings -- basil, celery seed, chives, dill, fennel, garlic, horseradish, mustard, oregano, paprika, parsley, pepper, rosemary, saffron, tarragon, thyme. Just as you use salt to taste, the same applies to herbs. There are no hard and fast rules for the amounts or combinations to use. The pungency of each herb will differ as well as the effect it has on the foods to which it's added. When using dried herbs, age will also affect the flavor. 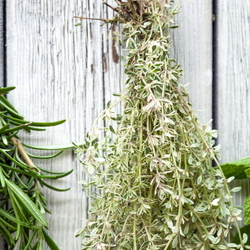 Herbs that have been on the shelves for awhile will seldom have as strong a flavor as fresh herbs. Recipes offer guidelines, but seasoning to taste is always the rule. Begin with a small amount of an herb, sample, add more if desired. Keep in mind that you can always add to but you can't take out what's already been put in. Once you become acquainted with the subtle nuances of various herbs, you will become more confident about the kinds and amounts of an herb to use when you need to add it to a dish. A delicious dish is the perfect reward for using herbs and is certain to garner many compliments for the cook. It's the sweet, or perhaps spicy, taste of success.